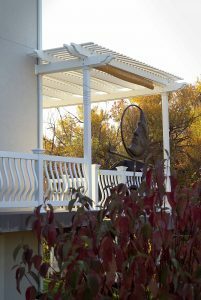 Pergolas are prized in today’s market for their versatility, energy efficiency, and aesthetic simplicity. When added to a deck, they can create continuity between indoor and outdoor spaces and extend the coziness of your home to your backyard. When made free standing, pergolas can provide a variety of functions while adding dynamic flare to an otherwise dormant outdoor area. Our vinyl pergolas can be designed to match any home, backyard or deck. Avoid that hot summer sun and rediscover the charm of the outdoors! Call us for a free consultation and find out how a pergola can enhance your home.